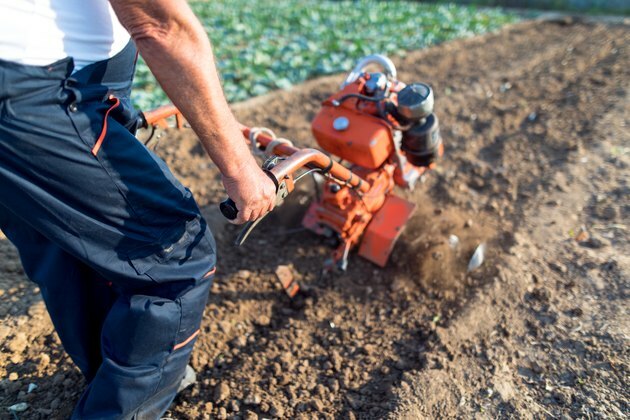 Farmers and home gardeners alike use a plow, also spelled plough, to break up weeds, aerate the soil, create a loose layer of topsoil and to arrange the soil into hills or furrows. Plowing is an essential practice to ensure the success of a crop or garden. Without plowing, weeds can out-compete sown crops, soil will not maintain healthy levels of oxygen and seeds may struggle to take root in compact soil. Different types of plows exist for different end goals. For large acreage, plows attach to a tractor and can be quite wide in order to cover the area efficiently. However, smaller walk-behind plows allow home gardeners to gain the same benefits of a heavy-duty farm plow but with the maneuverability needed in a smaller space. No single plow can perform every desirable function at once, so farmers often plow their fields twice. A common combination of farm plows is a moldboard plow followed by a disc plow. The moldboard plow consists of a single blade that lifts into wings on either side to push the dirt into furrows. It slices into the topsoil and folds it over onto either side, effectively covering weeds and burying plant residue. This aids in controlling weeds, diseases and pests while also encouraging decomposition, which returns nutrients to the soil. However, a moldboard plow on its own does not create the soft, crumbly soil that facilitates seeding and root growth. A disc plow consists of rows of circular discs that chop the soil and plant matter into finer pieces, making the decomposition process happen even faster. A third type of plow that farmers commonly use is called a ridge plow. This type of plow arranges the soil into hills or ridges, which proves desirable for crops, such as potatoes and onions. A ridge plow looks like a modified moldboard plow, with two blades instead of one. Although tractor-powered plows represent an efficient option for large plots, they are cost prohibitive or simply impractical for most home gardeners. Many options exist for home gardeners and can fit any budget or preference. Walk-behind plows consist of a rotary blade that digs down into the soil and chops it in one pass. These plows are gas-powered, but manual versions do exist. Additionally, if you have a riding lawn mower, you may be able to attach a special version of a farm plow to the back. Finally, hand tools can be used for small plots. A tool called a hoe or ho allows you to slice into the soil, pull it into a hill or furrow and chop it into smaller pieces. These either have long handles and can be used while standing, or they can be found with short handles in order to allow you to work on your hands and knees.